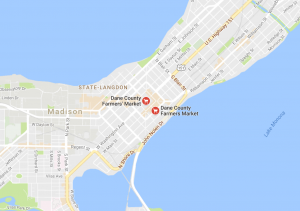 From the middle of April until the beginning of November, Madison’s very own farmer’s market is a Saturday morning staple. Get your friends up and out of bed and take a walk on over! There’s nothing better than waking up early on a Saturday morning and walking down a sun-filled State Street toward downtown Madison to the farmer’s market. Founded all the way back in 1972, the Dane County Farmer’s Market features over 200 vendors from farms located around the Madison area. Every Saturday from April until November their tents line the streets around the Wisconsin State Capitol building. The weekly tradition sees the roads closed down as hundreds of people flock to enjoy live music and tasty food. It’s truly makes for an excellent time! In addition to the folks selling locally grown veggies, juicy fruits, freshly baked bread, artisan crackers, meats, and delicious Wisconsin cheeses, there are also various other shops set up ranging from florists to arts and crafts to handmade clothing. No matter what you’re in the mood for, rest assured that there’s something awesome waiting for you at the Dane County Farmer’s Market.